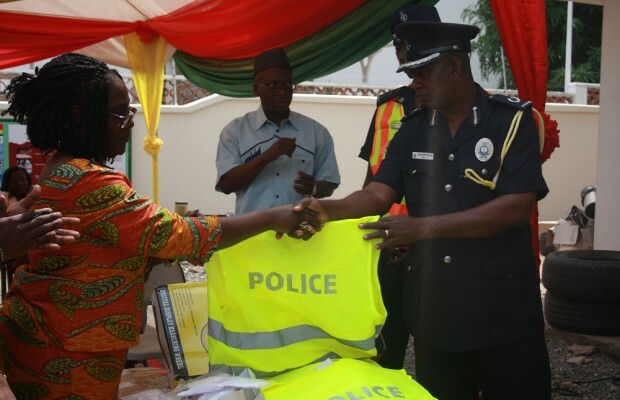 The National Safety Road Commission (NRSC) has presented safety gear worth GH¢ 200,000 to the Ghana Police Service to support their enforcement program in the Christmas season. According to Ing. May Obiri-Yeboah, Executive Director of the NRSC, the donation was part of the commission’s efforts to help improve road safety practices on the roads before, during and after the yuletide. Speaking during the presentation in Accra on Thursday, Mrs Obiri-Yeboah said her outfit would continue to support Police Motor Traffic and Transport Department (MTTD) to ensure that road traffic accidents reduce drastically in the country. “We consider road traffic enforcement crucial to road safety improvements. We have over the years been supporting police with resources to help build the capacity of the Police MTTD,” she said. The items which were procured with support from the Ghana Road Fund included 1,000 reflective vests, 200 magic lights, 200 white hand gloves, 100 body bags, 100 raincoats, 40 measuring wheel and 10 height gauges among others. She hinted that the Police MTTD and the Driver and Vehicle Licensing Authority (DVLA) would collaborate with other institutions like Guinness Ghana Limited, and Road Safety Management Services Limited to intensify enforcement efforts focusing on daily speed, alcohol checks, seatbelt and roadworthiness checks prior to departures at major terminals and on major road corridors across the country. After receiving the items on behalf of the Police MTTD, ACP Patrick Adusei Sarpong, Director General of MTTD commended the NRSC for the gesture and urged road users to be extra careful during the festive season.